Picks – or plectrums, as they’re known in the UK – are one of the most overlooked tonal contributors to guitar playing, despite their long and decorated history. Their usage dates back thousands of years, observable in art containing stringed instruments from Egypt, Asia, and the Middle East. For most early American and Western European guitar players, though, picks were often an afterthought. Their modern guitars evolved from the Spanish classic guitar, which had gut strings that were specifically conceived for finger-style playing. The modern “flat pick” has a more recent history, as finger-taxing steel strings have only been around for the last 90 years or so. Tracing the rise in popularity of the modern pick to an exact degree is difficult, but it does seem related to the evolution of changing music styles brought about in the early 20th century. In the early 1920s, fast-paced banjo-driven jazz and country music led to larger-bodied guitars (in particular, the X-braced dreadnought) that could compete sonically with the shrill cutting power of banjos (whose players were already utilizing early thumb picks). These large-bodied guitars eventually led to the advent of steel strings, which fundamentally changed the sound, tone, and projection of the acoustic guitar over its classical forebears. Tenor banjos were also introduced to bridge the gap between banjo and guitar. These early heavy gauge steel strings were rough on fingernails, and picks became a method of survival. Refinement of finger picks and thumb picks can be attributed to George D. Beauchamp – one of the contributors to the creation of the resophonic guitar. In 1928, he applied for a patent for a “pick for stringed musical instruments,” and his metal version was more durable and ergonomic than previous iterations. Though thumb picks had existed in various forms for decades (early blues and Hawaiian music relied on thumb picks, as one player was responsible for playing rhythm and melody parts on a single instrument), Beauchamp refined the idea with a design that influenced many of the succeeding forms. Early flat picks were made of rarefied tortoise shell (Hawksbill turtle, in fact), but these picks were always expensive to produce and quite delicate. Tortoise picks would have to be steamed flat, hand cut, hand beveled, and then hand polished. At every stage, there was a clear and present danger that the fragile picks would break. Many alternative materials were tried with various levels of success until 1922 when Luigi D’Andrea perfected the use of stamped celluloid. Shapes and build materials have varied since then, but the basic form has mostly remained the same. As guitar technology is always “hero” driven, Nick Lucas’s “flatpick style” became a defining moment for the flat pick as we know it today. Lucas’s 1929 rendition of “Tiptoe Through the Tulips” was an immense international hit, one that led to a Gibson signature model guitar and legions of guitar players copping his flatpickng technique. Herco later created the nylon pick that became the standard of the 1960s and 1970s. Dunlop bought the name and continues to make Herco picks alongside their own models. In the last 10 years, boutique picks have come into fashion, with PickBoy, Red Bear, V-Pick, Gravity, and countless others reinventing the form and materials at a furious pace. Picks have an effect not only on the sonic output of the instrument, but also on the feel of the player. As with all things in this ballpark, the question of how picks actually affect your tone will be met with subjective answers. Many variables must be taken into account, such as whether you’re playing an acoustic or electric instrument, body material of your instrument, and what pickups your instrument is fitted with. But the pick-specific variables can be broken down into four main categories: material, size, thickness, and point shape. Picks are made out of a wide variety of material – a quick search of Reverb (browse all picks here) will return all manner of plastic, metal, bone, horn, stone, wood, and even refashioned coin picks. Personally, I find that pick material has very little effect on electric guitar but comes heavily into play on acoustic guitar. On acoustic, the interplay of the contact of the string and the pick is much more magnified, and the attack and decay of the that interplay can be augmented with your choice of pick. Recently, Graphtech introduced picks made from their “man-made ivory” TUSQ material that is traditionally used for nuts and saddles. 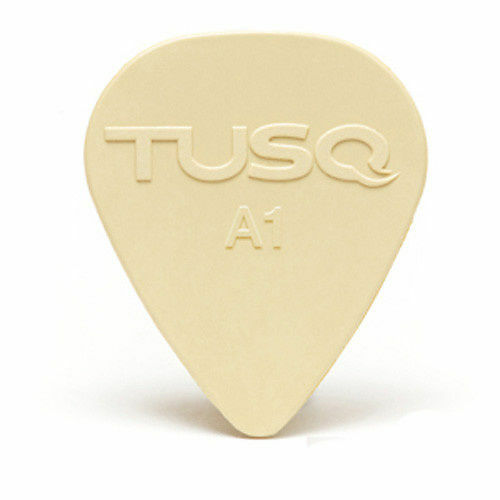 For my playing, I’ve found that TUSQ picks add more presence to acoustic playing, brightening or darkening the tone based on which of their “harmonic levels” is selected. Material also has an effect on the “attack” of the string for electric guitars. The most popular materials fall into two categories: hard plastics like Dunlop’s Tortex and Ultex, and softer plastics like Nylon. Hard plastics tend to have a brighter attack, which can help bring out the dynamics in your playing. Brian May has famously used a British sixpence coin for decades, as he feels that the rigidity aids in his feel for the strings. Darker or bassy sounding instruments can benefit from harder picks, which allows more midrange and treble frequencies to be translated through the pickups. Nylon and softer material picks have a slower attack, which could be termed as “darker.” I find that softer picks work great when taming hotter pickups. Ceramic pickups can over-accentuate high/treble frequencies, and nylon picks can mellow the power a bit. 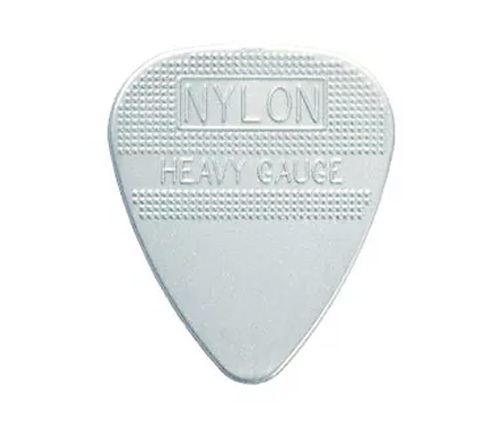 Nylon picks also give a softer, more vintage sound to electric guitars, which is great for gritty blues or jazz. Size of picks has less to do with tone, and more to do with comfort. The vast majority of picks fall into the standard “teardrop” shape we are all accustomed to. 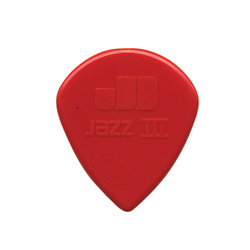 Many rock players – such as Joe Bonamassa – have been faithful users of Dunlop’s Jazz III, which is 25% smaller than the prototypical pick. Carlos Santana, on the other hand, uses very large triangular picks where each side comes to a point. Thickness dictates how much give the pick has as it pulls across the string during the attack. This perhaps has more impact than any other factor in the player-to-guitar interface. Certain styles of playing are even rooted in a certain thickness of pick. For example, most bluegrass flatpickers won't play with anything less than 1.0mm thick. The lack of give makes it easier to get the snap and command you want from your strings when playing bluegrass leads. Boom-chick accompaniment comes off with authority as strings ring loud and clear with even moderate raking across the strings. Thin picks tend to reveal themselves more on acoustic guitars, where the attack takes on a plasticky "swish" during strumming. Single note runs will not have the same power or resonance on acoustic guitars with thin picks. Electric guitars don't broadcast the pick type as obviously, and the help of hot pickups and amplification reduce the need to generate power and dynamics from the strength of your pick. Eddie Van Halen and Paul Gilbert are both advocates for using very thin picks for lead playing, for instance. On the extreme end, V-Pick has pioneered picks with thicknesses ranging up to 11mm. Whether you appreciate the unyielding attack of something like that or prefer the pliant give of a thin pick is something only lots of playing and reflecting will determine. 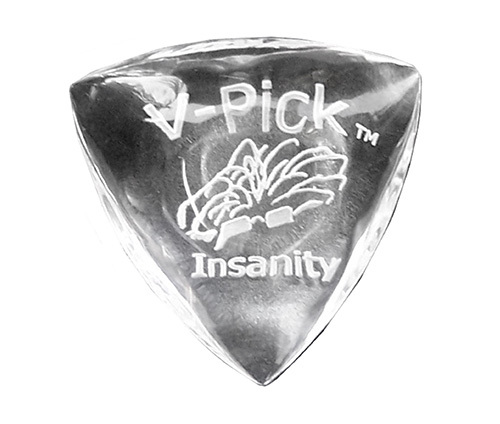 The point of the pick has a clear effect on playability and tone. I find that the point of the pick can be the best determinant of how the pick is to be used. 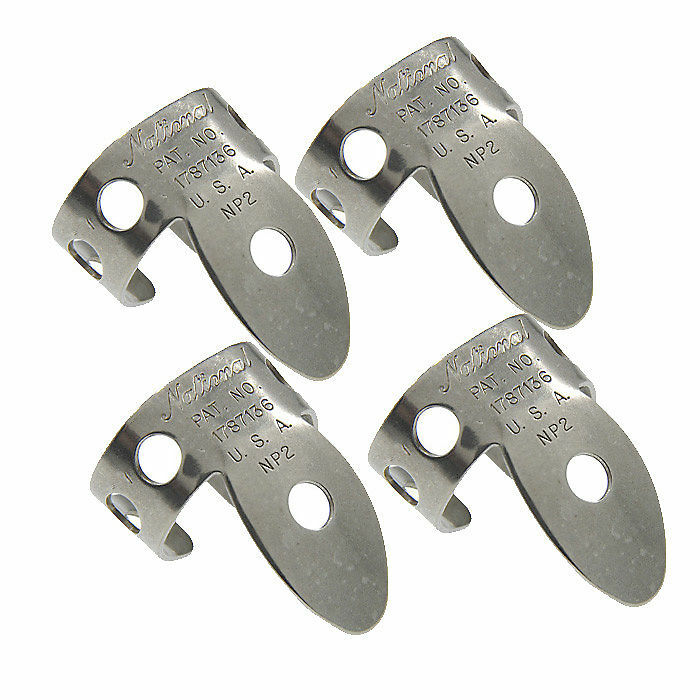 Many believe that for fast playing, a highly pointed pick is the best shape for speed. Satchel from the ‘80s revival band Steel Panther goes so far as to file his picks to a sharper point. This is not a rule, however. Brian May, for example, uses a completely round coin, and his speed and articulation are considered excellent. I personally prefer a sharper point for both lead and rhythm playing because I’ve found that duller points lead to too much “note smear” for my taste. Pick points wear down rapidly, so artists who prefer sharper points tend to go through picks quite rapidly. As with all things instrument related, it is all about getting that specific sound in your head to translate to your playing with the most effortless execution. My personal pick taste is varied. 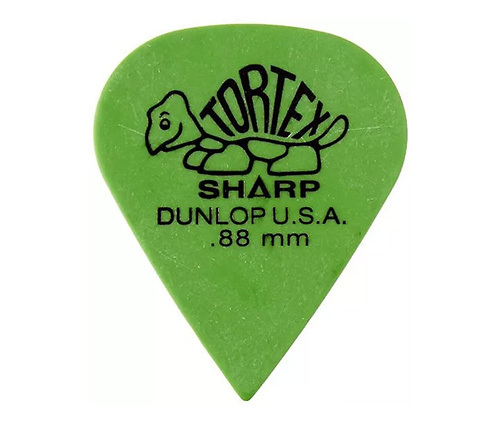 For electrics, I use the Dunlop Tortex 0.88mm for darker guitars and Herco Nylon Heavy reissue for brighter guitars. For acoustic instruments, I use Dunlop 1mm Nylons or my new favorite TUSQ “Warm Toned” 0.88mm picks. That being said, I still like to experiment with horn picks, metal picks, and all of the new plastics that have been popular recently. Fortunately, picks are a very inexpensive way to experiment with tone and feel. If you feel your playing is in a rut, grabbing a few different picks can make all the difference and reinvigorate your creativity.